I’m not a photographer, to excuse the unglamourous photo, but I’m telling you these sandwiches are easy and delicious! 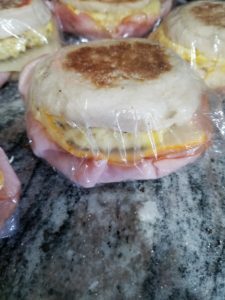 My husband loves them, so they’re easy to make on a weekend morning and freeze them. You can do any combination. I scrambled 10 large eggs with 1 cup of nonfat milk, added lots of pepper, and then poured into a sprayed 9×13 pan. (Sometimes I add chopped cooked spinach). I baked at 375F for 25 min. I used a biscuit cutter the same as the English muffins I used to make 6 rounds of egg. Toasted the English muffins lightly, so they’d be firmer than untoasted. Topped with the egg, then a slice of Muenster cheese, and topped with sliced ham. But I’ve used bacon and sausage before. It’s all up to you. Then I wrap in saran wrap and freeze them.